I really love this new series, The Murder Notebooks, by Anne Cassidy. The first book in the series, Dead Time, was my first introduction to Anne Cassidy's novels, and I will certainly pick up her backlist on the strength of these two books. I really love the idea behind the books, but especially the characters. The Murder Notebooks series is based around the disppearance of Rose and Joshua's parents many years ago. Both Rose's mum and Joshua's dad were police officers working cold cases and were all set to get married and make the four of them into a proper family. But one day, the two disappear, presumed dead and Rose and Joshua are shipped off to different areas of the country. Then Joshua gets in contact with Rose and together with Joshua's roommate, Skeggsy, they begin to piece together the events of many years ago and try to get to the bottom of the disappearance of their parents. This series is really wonderfully done, with a fast pace, great characters, an exciting murder to solve and really tantalising clues about their parents and what they could have been up to. I was very, very excited to read the second book in the series, Killing Rachel, and as soon as the book arrived, I dove into it immediately. Rose and Joshua are really brilliant characters. I especially love Rose's confusion about her feelings for Joshua. They spent several years together as step-siblings but have spent the last 5 years away from each other. And while Rose still values Joshua as a missing family member, she's also feeling jealous over the time he spends with another girl and is beginning to realise that she doesn't see him quite as a brother any longer. But really, this relationship between Rose and Joshua is quite a small but important storyline in something much bigger. With Killing Rachel, we delve more into Rose's experience in the past at a boarding school in which she had a complicated friendship with a girl called Rachel. At the beginning of Killing Rachel, Rose begins to get communication from Rachel ... letters mostly, but also phone calls. As the reader, we're not yet privy to Rose and Rachel's past friendship but it must be something complicated and interesting from the way Rose reacts. As the novel goes on, we're let in on more of the interactions between Rose and Rachel and really get a feeling for this important experience that shapes who Rose has become. And as Rose faces up to her friendship with Rachel, Joshua is still hell-bent on finding out everything that he can about his father's last known cases and his whereabouts shortly before he went missing. Digging into different leads, Joshua goes on his own search around the Norfolk coast and winds up in a dangerous position! I really love both of these characters, from how driven Joshua is in finding out the truth to how emotionally distant that Rose seems to be. I really cannot wait to see where the story will go next and what new information can be found out by this pair of sleuths! 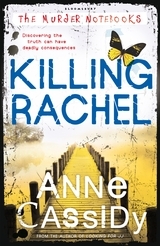 Killing Rachel by Anne Cassidy is being published by Bloomsbury this month. I urge you to pick up both Dead Time and Killing Rachel and to dive into this intriguing series! I recently got approved for this book on Netgalley but then I realised it's the second book in the series (and I haven't read the first one) :( Do you think they can be read in any order or as standalones? Or do you need the first book to understand this one? There's like story arcs for each individual book, but I'd say the series arc is pretty big in it, so I'm not sure how easy it would be to read the 2nd book before the 1st! You're welcome, Iffath! I've yet to read any of Anne's other books, but I'd really like to pick them up. Especially Looking For JJ, as I hear there will be a sequel.. I love this series though, I really hope you do read them!